You’ve probably heard of the Charles Bridge, Prague’s most famous sight – like you’ve probably heard of Nelson’s Column in London, the Colosseum in Rome, the Eiffel Tower in Paris, and New York City’s Empire State building. Question is, do you make a beeline for a city’s best-known sights, or do you give them a miss, preferring to seek out the less ordinary, the off-beat, the hidden gem? Personally, I do a bit of both, but in any case I don’t have any real objection to hitting the main tourist sights, however busy they are. They are famous, after all, for a reason – history, size, beauty, association – and I’m keen as the next person to see what all the fuss is about. Some I like, some I don’t. Some stay with me forever, forming part of my travel landscape; others barely register (and I’m talking as someone who gave the touristy bit of the Great Wall of China a big old ‘meh’). But I do have a suggestion for getting the best from the world’s most famous sights and monuments. Give yourself time. Slow your pace. Put your visit in context. Sure, it’s horrendously busy, and on every tour-bus circuit, and choc-full of souvenir stands. But there must be something about this place – any place – that makes it so alluring in the first place. 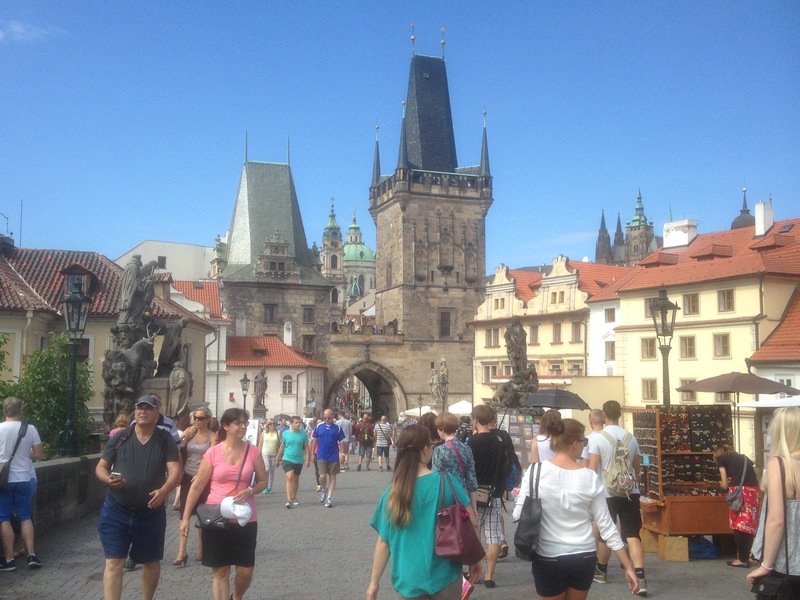 Which is why I spent an hour or two hanging around Prague’s Charles Bridge – or Karluv Most, as I discovered it was actually called, once I slowed down to read the signs. It’s been here since the 14th century, which is far longer than a lot of countries, let alone other structures. At 600 metres long, and ten wide, it’s more boulevard than bridge, and while this means that you can pack a lot of people onto its span – day and night – it also means that the whole of human life is there, just waiting to be spotted, selfied and photo-bombed. Slow down your visit, walk to and fro half a dozen times, instead of just the obligatory once, and other things start to resonate. The famous Baroque statues of saints might be all now be replicas (the originals in the National Museum), but they have real power – reminders that, for 17th- and 18th-century citizens of Prague, saints’ lives, miracles, parables and Bible stories were part of the fabric of daily life. Even today, commemorative plaques and statue parts show the faded gleam and wear of the touching of thousands upon thousands of hands. The art and souvenir stalls offer few surprises, as you might expect, but the buskers were excellent – including a swinging trad jazz band which provided just the right note of vintage louche accompaniment to a stroll. And tour group after tour group – following guides with parasols and flags – showed exactly why you should slow down and take it easy, even at the busiest of tourist attractions. Across they march, with a stop at a statue for a mangled anecdote or two, and a quick photograph of the river from the middle of the bridge, before heading off up to the castle and the next stop on their tour of Prague. What did they really see, I wondered? Not the ancient cobbled alleys under the bridge; not the anguish of the crucifixion against a piercing blue sky; not the sly yawn of a jauntily dressed boatman, still waiting for a fare; not the synchronised stomp of the city street cleaners with their orange bins. 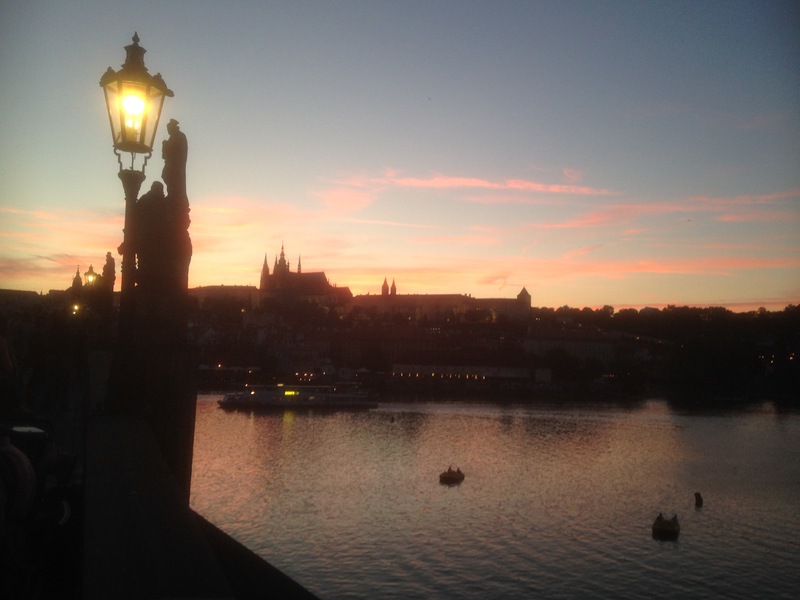 That’s what I saw, on the day I decided to spend some time at the Charles Bridge in Prague. You – I have no doubt – will see something different again, which is exactly as it should be. The best pubs in Dublin – Sláinte!